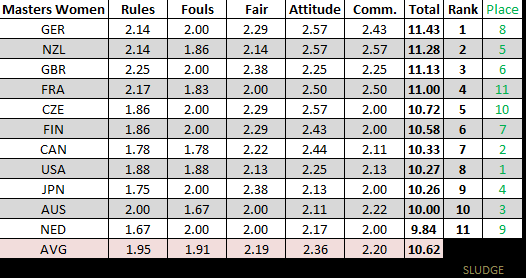 Though overall reporting of ultimate scores via social media still needs improving, there are recent examples that deserve attention. First, thank you to teams live-tweeting games. For those club ultimate teams already live tweeting your game, then PLEASE consider your audience when your game finishes. More information (beyond the final score) about your game is recommended and encouraged. At a minimum, give the final score + the name of the other team. Just lost 7-13 to @100percentBS. Great game and awesome spirit!! Next level: final score + halftime score + the name of the other team. We take the first one over BENT 10-6 in a fun, spirited game. (H 7-3) Great game ladies! Moving up another level...final score+ halftime score + brief recap + opponent. Wow! Final score + halftime scores + opponent + brief recap by video. Know of more examples? Please share! 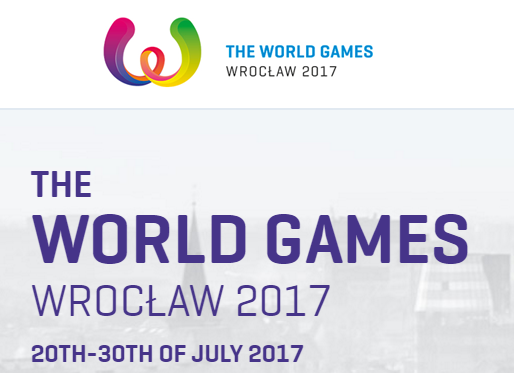 WFDF's World Junior Ultimate Championships is scheduled for June 31 through August 6 in Wroclaw, Poland. A total of 49 teams from around the world will be competing during the international tournament. The majority of participating countries are sending teams in both - men and women - divisions. A total of twenty(20) countries are represented in both divisions; Australia, Austria, Canada, Colombia, Czech Republic, Finland, France, Germany, Great Britain, Ireland, Italy, Japan, Netherlands, New Zealand, Poland, Russia, Slovakia, Slovenia, Switzerland, and United States. Plus, these nine (9) countries are represented by only a men's team: Belgium, Chinese Taipei (Taiwan), Denmark, Hungary, India, Israel, Mexico, Spain, and Sweden. 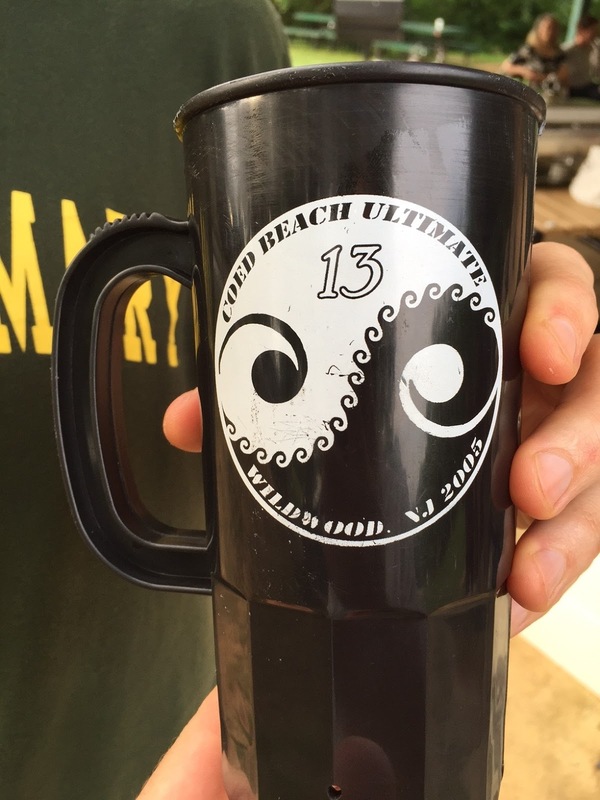 Wildwood "The largest beach ultimate event in the world" Beach Ultimate Tournament starts this weekend. Such fond memories of playing at the beach ultimate in Wildwood, New Jersey. Video of the injury inducing collision between Laurel Oldershaw (SF Nightlock) and Jenny Wei (All-Star Tour team) in a recent exhibition ultimate game will not be posted on this blog. I have chosen not to post this content because of the gruesome nature of the leg injury. The injury ended the Nightlock-All-Star Team match prematurely. I'm sure you can figure out a way to find it if you really want to see the nasty clip; just not on this site. Speedy recovery wishes to Laurel! Which method is a more effective way to count out seconds? 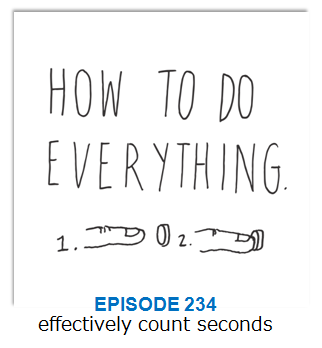 How To Do Everything podcast [ep 234; March 11, 2016] unscientifically tested the methods of how fast people counted seconds. Counting is a skill players (and observers) in a self-refereed sports must possess. Most of the counting participants on the podcast counted too slow with the word pausing. It's generally accepted that ultimate players fast count their stalling. So, would requiring a word pause help with the a correctly interval-ed stall count? By rule, the word "Stalling" should start or restart every stall count as a signal. A solution might be to require the word "stalling" to be used in between each number in the marker's stall count. So, this would truly be the ultimate science fair project, or just a fun experiment at an ultimate tournament. 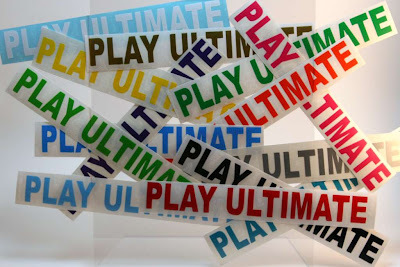 Can an ultimate player accurately count up to 10 seconds by 1-second intervals. Compare results of count before being active and after running, or being a marker. Can an ultimate player looking to throw a disc ably judge when a stall count is not at 1-second intervals? Compare the the standard counting up (1-10) with counting down (to 0) with accuracy with stall counts. Nothing says summertime more than a Frisbee, according to advertisers. 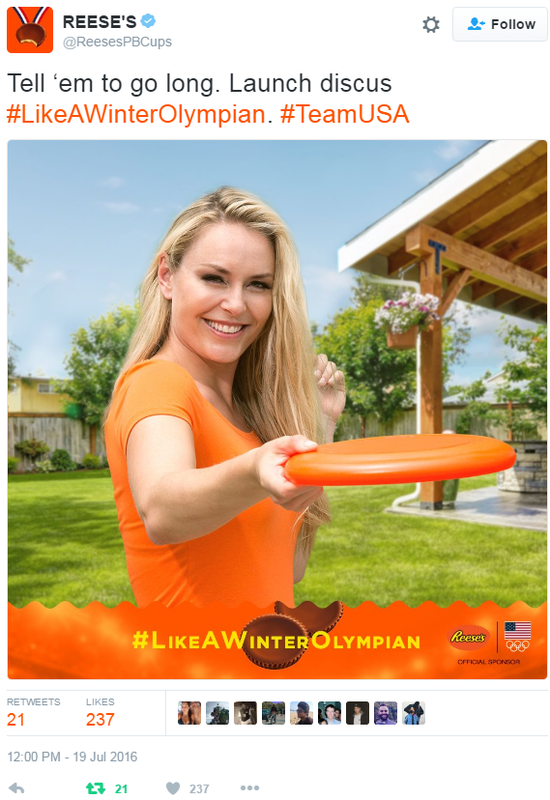 Olympian Lindsey Vonn (who has a Frisbee history) is seen throwing a discus [sic] for REESE's. 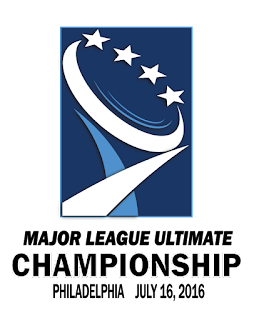 The DC Breeze lost in overtime to Toronto Rush in Saturday's AUDL East Division Championship game by the score of 21-23 (10-11 half). 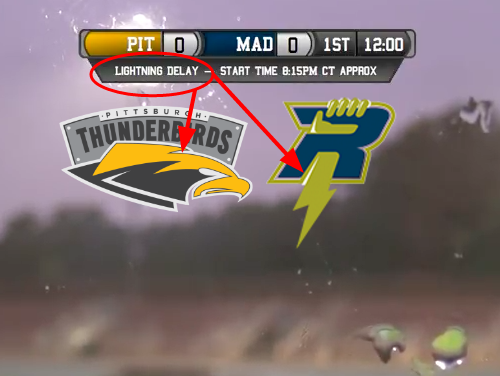 There was a collision of epic proportions during the 2nd quarter of this AUDL playoff game. 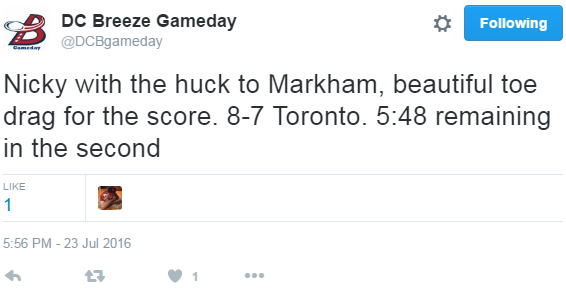 In retrospect, A LOT more happened on this D.C. score than what the Breeze's gameday twitter account provided. Toronto gave a little bit more details, but still falls short to what actually happened. Ultimate is slated to become a recognized team sport in Arlington (Virginia) Public Schools for middle schools and high schools. If approved, APS will fund ultimate uniforms and ultimate coaches, plus pay transportation to local games. From the article: School Board members in mid-August are slated to approve its addition to the ranks of intramural sports in county middle schools, high schools and specialty programs, with competition starting in the fall. That will change if the School Board OKs the program for intramural ("co-curricular" in school-speak) status. Under the proposal, each secondary school or program will field teams for girls and boys, with practice taking place in September and competition running throughout October. The estimated $92,000 cost of managing the program and funding equipment and uniforms will be carved out of the existing school-system budget. 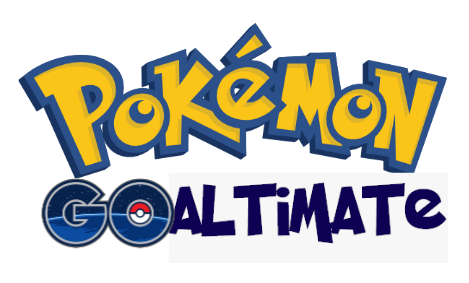 Catch in the real world with pokemonGO-ALTIMATE. After a highlight-filled, Mayor-attended playoff win by D.C., the Breeze (10-4; 1-0) travel to Toronto (12-2; 0-0) for the AUDL East Division Championship at 5pm on Saturday. Toronto leads the 2016 regular season series (2-1), and is (1-0) all-time versus DC in the postseason. Rush beat the Breeze by 26 goals in their only postseason meeting back in July 2014. 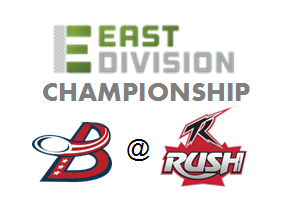 Toronto Rush are undefeated (3-0 all-time) in the East Division Championship game; it will be the D.C. Breeze's first appearance. The Breeze have won 5 consecutive games while Toronto has won their last 4 games. D.C. Breeze are the only American-based East Division team to ever win a game against Toronto Rush. DC Breeze have won only 1 out of 4 games played in Canada during the 2016 AUDL regular season. Read the playoff preview by Toronto. WFDF's 2016 World Ultimate (& Guts) Championships were held in London in June. The final results have already been posted. 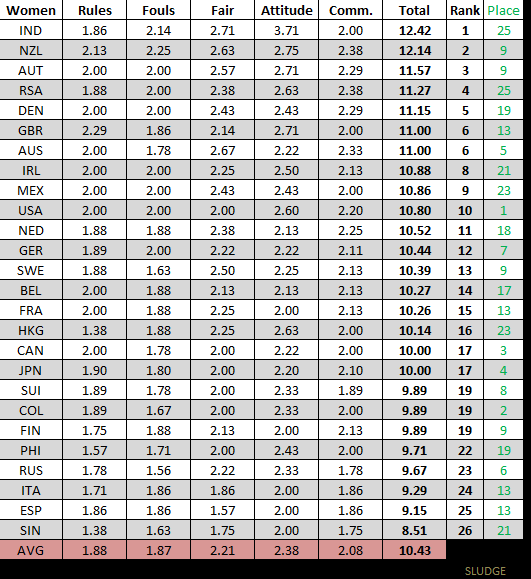 Now, let's have a look at the Spirit of the Game scores for each ultimate team in the five divisions. 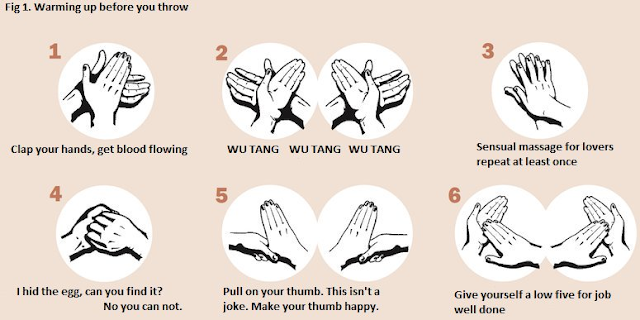 Best possible score = 20. 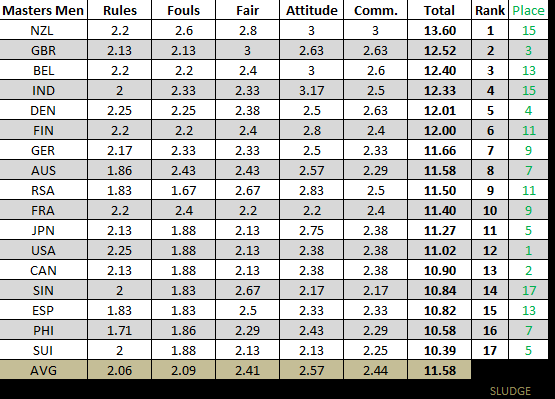 Teams are awarded points in each category: 4 (Excellent), 3 (Very good), 2 (Good), 1 (Not so good), or 0 (Poor) points respectively, yielding a score range of 0-20 points per team per game. NOTE 1: *Due to a scheduling issue, the Women's Masters Spirit Award was initially presented to New Zealand, who scored the highest average total Spirit score (11.29) at the division's final. 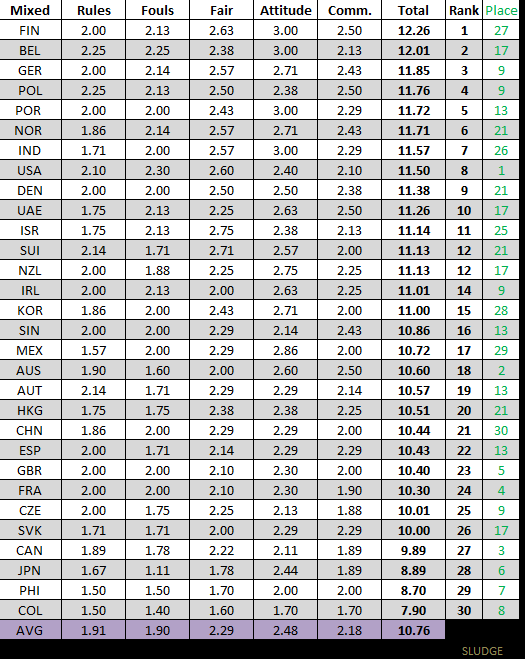 Placing games were then played after the final (due to rain delays) which placed Germany at the top of the average total Spirit rankings (11.43). WFDF recognized both Germany and New Zealand as joint winners of the award in honor of Spirit of the Game. NOTE 2: There were some discrepancies in the Total computation in the WFDF WUGC online data and when the totals of the five categories were calculated in Excel. 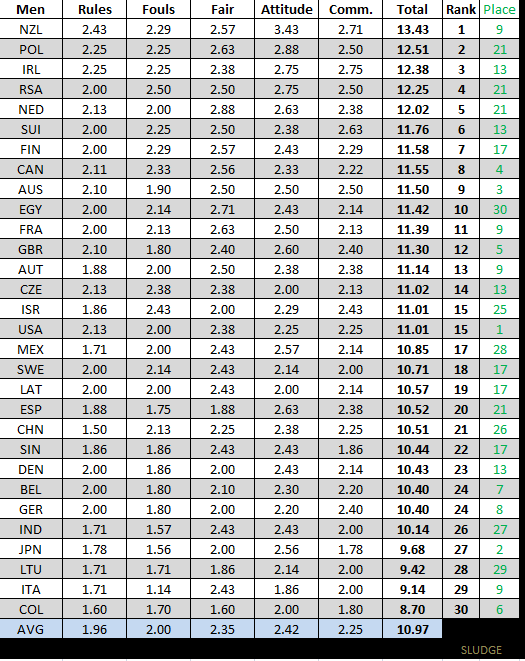 What you see in the charts is WFDF category data and then Excel-calculated totals. The crowdfunded traveling ultimate team starts this week! The team of college women ultimate players are scheduled to visit nine cities in the next 4 weeks. 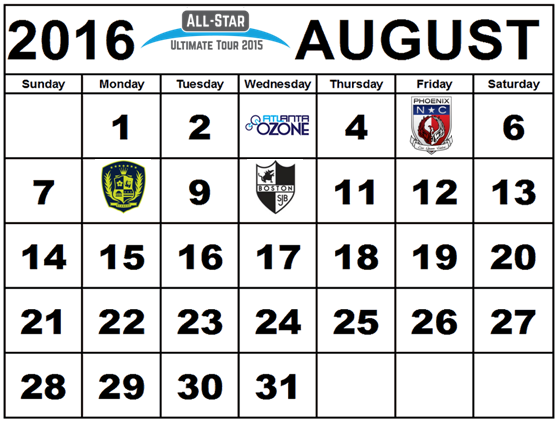 Mark your calendar for the All-Star Ultimate Tour. This time starting next year, The World Games 2017 will begin and the U.S.A. team will defend its title in the sport of Flying Disc (a.k.a. ultimate). 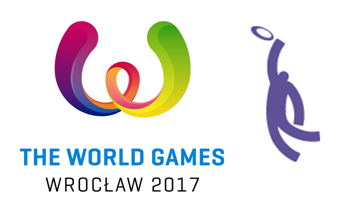 The World Flying Disc Federation recently announced the national teams that qualified for the Flying Disc event in the 2017 IWGA World Games, which will be held in the city of Wroclaw, Poland, from July 20 to 30. 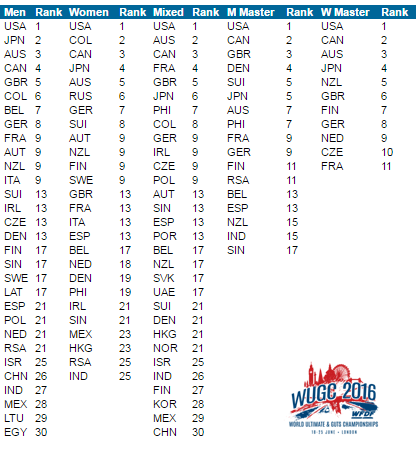 The five countries, based on the WUGC 2016 results, are: United States of America, Japan, Australia, Colombia, Canada, plus Poland, which is given a bid as the host country. Each country will field a mixed division team to play at The World Games (TWG). This is a team game that combines elements of basketball, football, handball and rugby. The game involves two teams of seven members....It is forbidden to run with the disc, and points are won if it is caught within an eighteen meters long zone. There are no referees in this game and all disputes are resolved by players in accordance with the principles of fair play. Players with high technical training can push the disc into unprecedented flight path. The USA results have been known for weeks, but here now are the final results of WFDF's 2016 World Ultimate (and Guts) Championships. Alan Kolick (#99, in blue) with a high-flying diving catch score around the defender was featured as the #5 play on SportsCenter's Top-10. 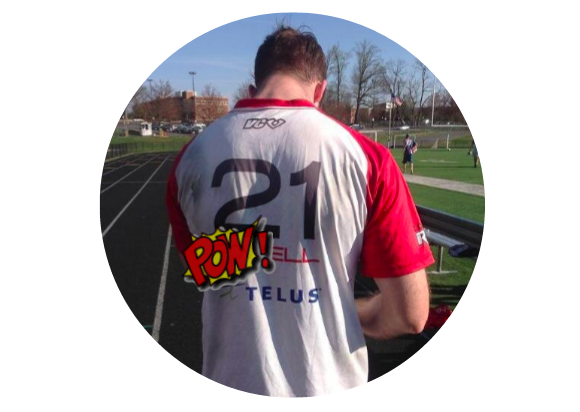 This was one of 2 goals Kolick caught during DC Breeze's 24-20 AUDL playoff win over New York Empire on Saturday. John Anderson: "Am I wrong, do we show the frisbee guys every day?...I think we do." This kind of thing is very familiar for Mr. Kolick. At the top with a combined (16-8) record — Rainmakers (7-3; MLU) and Cascades (9-5; AUDL) — Seattle is the only city with both pro ultimate teams with a winning record. 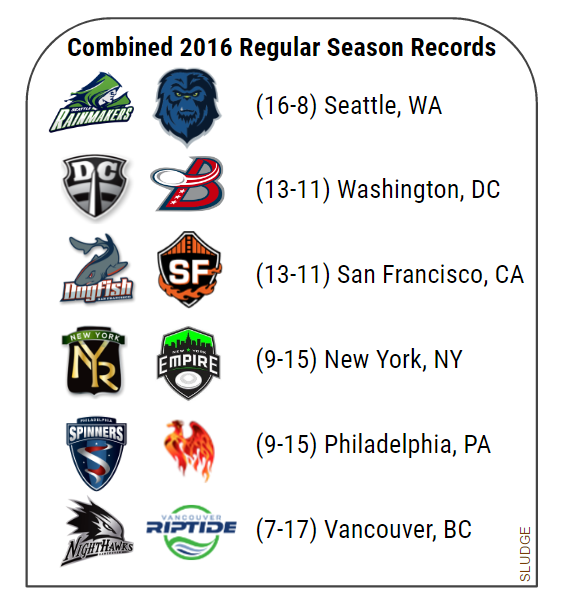 At the bottom are both Vancouver teams with losing records — Nighthawks (1-9; MLU) and Riptide (6-8; AUDL). The AUDL teams in 4 of the 6 cities posted a better record than their MLU counterpart. 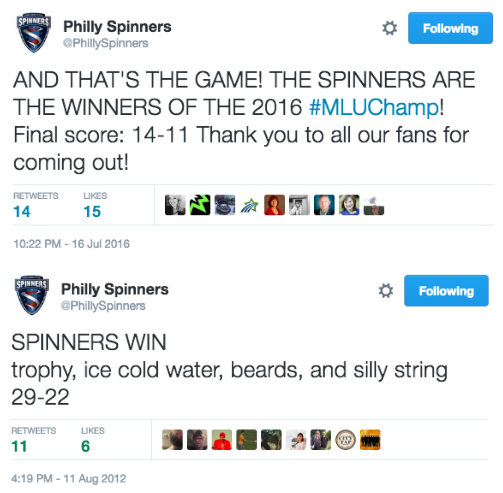 Philadelphia Spinners already won the 2016 MLU trophy. Seattle Cascades have advanced to the 2016 AUDL Championship Weekend. The series evaluating the team logos and nicknames of the professional Ultimate leagues is complete. 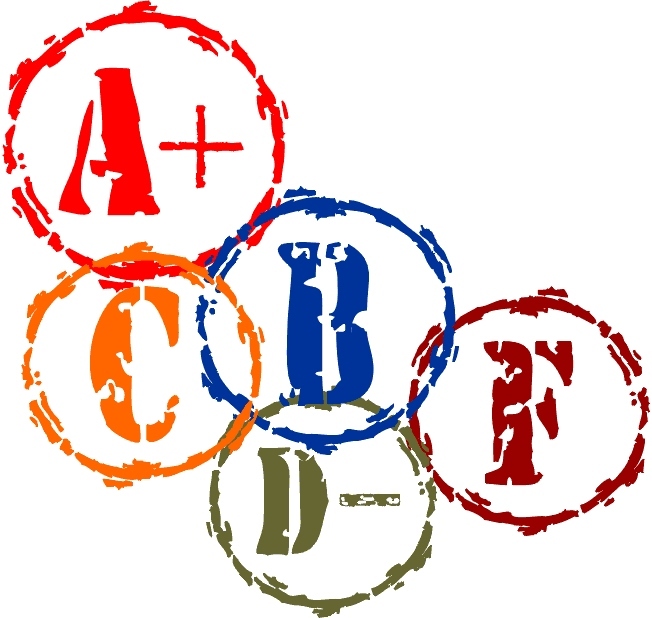 A compilation of final grades for the new and updated 2016 AUDL teams are below. Tonight is Major League Ultimate's Championship game located, again, in Philadelphia. 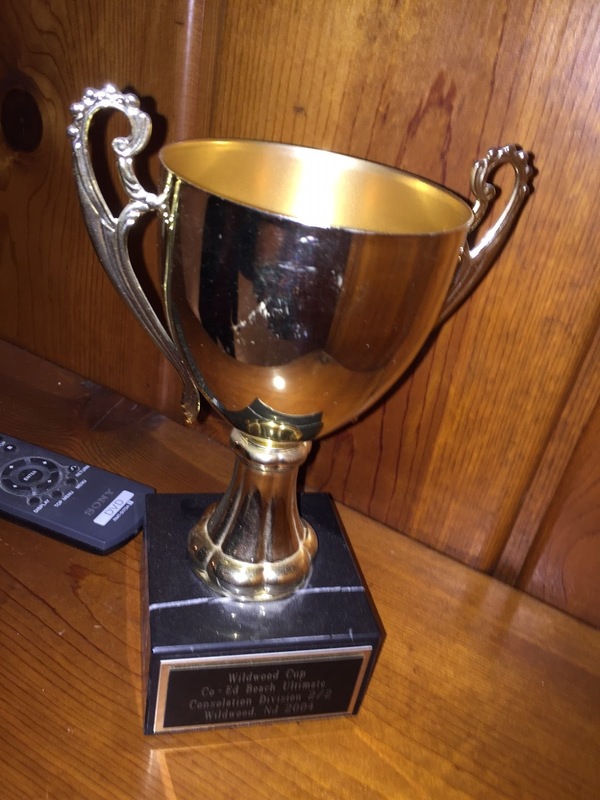 Both Divisional winners have the best record in the league and make their first championship appearance. They face off at 6:30pm at Franklin Field. Tickets are on sale for $22. Or, watch online. 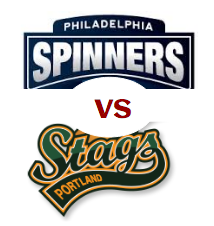 Portland Stags (9-1; 1-0) versus Philadelphia Spinners (9-1; 1-0). Disc Don't Lie by Dusty Rhodes. Friday Happy Hour by William Curb. 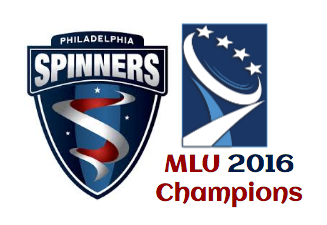 If the Spinners win, they would become the first and only team to win championships in both semi-pro ultimate leagues. If the Stags win, they would become the first and only Western Conference team to win the MLU crown. 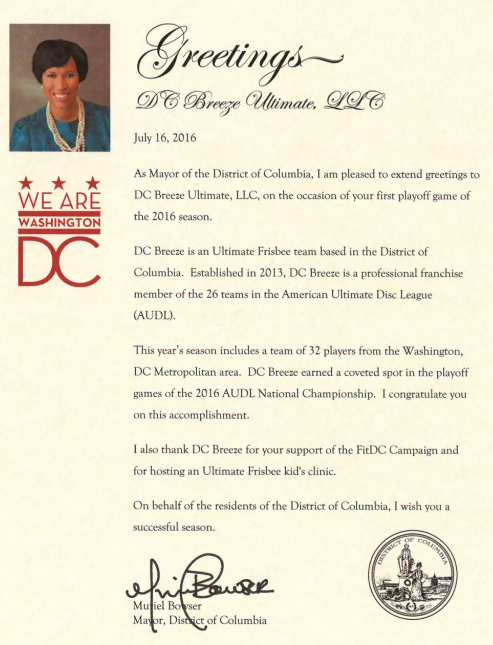 Well, the eventual MLU 2016 Championship winner is guaranteed to be a team that begins and ends with an "S."
The D.C. Breeze (Ultimate, LLC) have been formally recognized by Muriel Bowser, the mayor of Washington, D.C. There's a rumor that Bowser will be in attendance at the Breeze's first-ever AUDL home playoff game on Saturday night. Comedy Central gives a farcical history lesson about ultimate frisbee. How it changed from a game to a sport. An interview with the first woman ultimate frisbee player. Plus, the cheating scandal. And, this quote: "Sometimes life throws you a curveball. 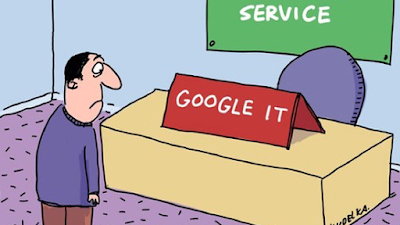 But, sometimes, life throws you a frisbee." 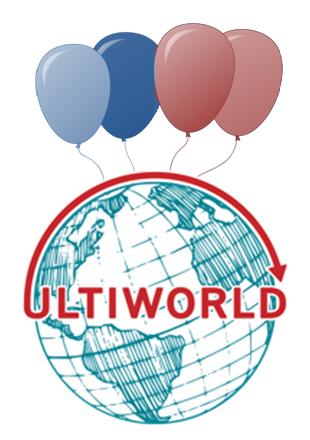 Ultiworld officially launched on this day (July 14) in 2012. Jacksonville Cannons were just called out about one aggressive play in the 2016 season, however this behavior has been somewhat condoned by the Jax team coach back in their inaugural (2015) season. "Our team plays a passionate style of ultimate and are still learning the balance of playing with passion and playing a style of game that is understood and accepted by refs. We have received three ejections in our last three games. 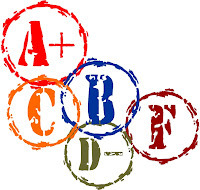 We have used every one of them as a learning experience and will make proper changes." "In other sports, the calls my players received would be laughed at and highly scrutinized by media and referee crew, but as our sport transitions from a dying mentality and moves toward mainstream sports, we still have to deal with varying standards and perceptions." Finding a sponsor's logo on a soccer jersey is commonplace. Now NBA will allow ads on team jerseys starting in the 2017-2018 season. See an example of Philadelphia 76ers' updated jersey. 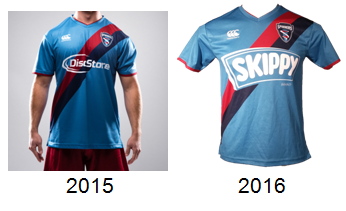 In Major League Ultimate, jerseys have always been an available billboard for willing sponsors. 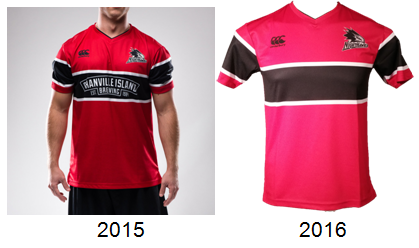 The 2016 jersey manufacturer (Canterbury) is the same as in 2015, but the majority of sponsors found on team jerseys have changed from last season. 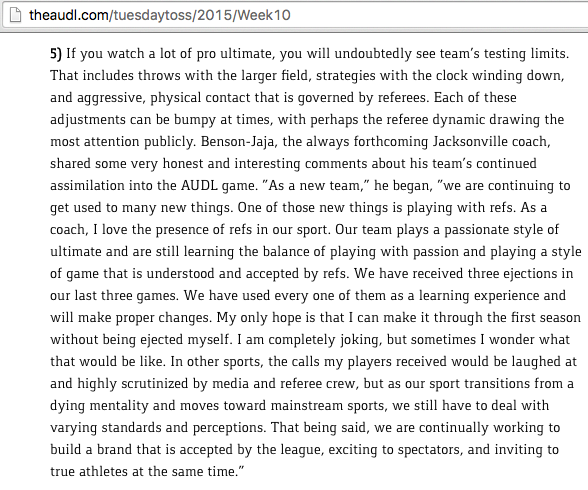 Of note, Cleats and Cufflinks [episode 44; April 2016] indicated that MLU would not accept a "vice" brand (beer, alcohol, tobacco) as a jersey sponsor because of inappropriateness message to youth. They could sponsor the league, just not the jersey. 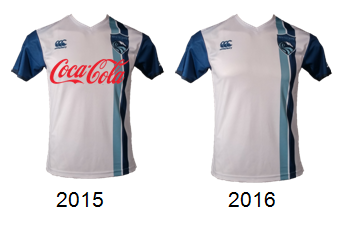 Boston Whitecaps had Coca-Cola in 2015, but was sponsor-less in 2016. 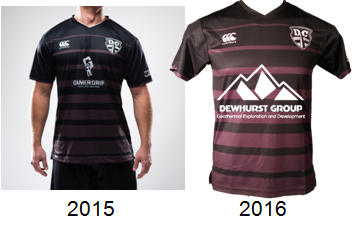 D.C. Current had GamerGrip in 2015, but their new sponsor was Dewhurst Group. New York Rumble were sponsored by US Coachways in 2015, but that transportation company was renamed to BusRentals.com which was reflected on the Rumble's 2016 tops. Philadelphia Spinners were sponsored by Disc Store in the 2015 season, but now have Skippy peanut butter in 2016. Elemental Technologies continued sponsoring the Portland Stags, and Point6 was, again, on the Seattle Rainmakers' tops. 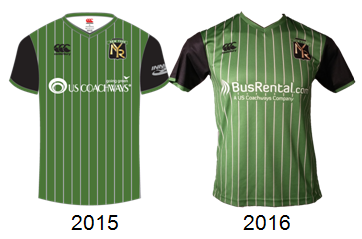 San Francisco Dogfish did not have a jersey sponsor in 2016 - just like last year. The only Western Conference team with an updated jersey is Vancouver. Nighthawks had Granville Island Brewing in 2015, but was sponsor-less in 2016. The logo of Innova, the official disc manufacturer of Major League Ultimate, can be found on every MLU team's jersey during the 2016 season. "We're all kind of weird anyway. You have to be a little different to find happiness in chasing a piece of plastic around." Today's tip: Add three yards to your flick with this simple warm up. 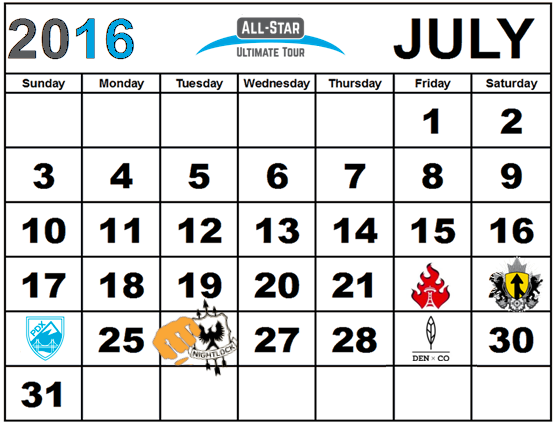 After 15 weeks, the American Ultimate Dis League 2016 postseason has been determined. 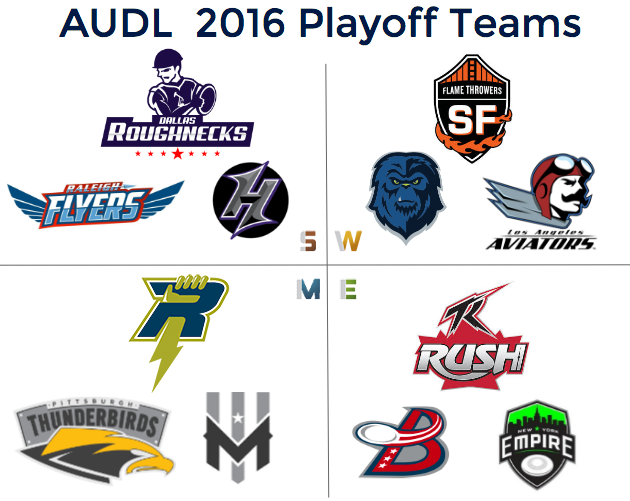 The AUDL welcomes 4 new playoff teams this year - Dallas Roughnecks, Atlanta Hustle, Los Angeles Aviators, and Minnesota Wind Chill, while 7 teams return to the AUDL playoffs. The East Division looks familiar by welcoming back DC. The Midwest, again, needs to go through undefeated Madison. One of the South's new teams won the division crown - undefeated Dallas. And, a new division champion emerges also in the West. With their 8-goal loss on Saturday versus Montreal, the Philadelphia Phoenix became the fourth franchise - and the first East Division team - in American Ultimate Disc League history to go winless in the regular season. The Philadelphia AUDL team joins the Cincinnati Revolution as the other AUDL team to have lost all their games in the 2016 season. Sunday's loss was also the Philadelphia's 15th loss in a row going back to the 2015 season. Philadelphia's last win was against the Rochester Dragons on July 12, 2015. 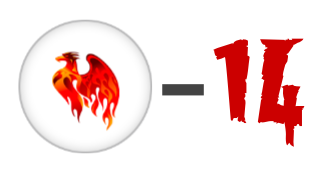 The Phoenix end their 3rd consecutive losing season with a -168 point differential.